A Basic Vocabulary of Scientific and Technological German is a collection of common scientific and technological terms used in many fields in science, commerce, and industry. This book provides the most commonly used German terms and words in the applied and pure sciences, such as anatomy and physiology, and in commerce and industry. The author explains German grammar particularly as it is used in modern scientific and research papers. He introduces the concept of separable and inseparable compounds and explains sample uses. 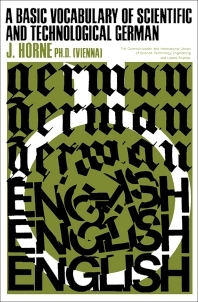 Like in English, he also explains how words are compounded and constructed in the German language. German punctuation is also noted. The book discusses irregular verbs that can be grouped into 14 sections. A particular section that can prove useful is a list of abbreviations and their meanings as these are used in German scientific and technical papers. A dictionary, a table of irregular verbs, and other conversion tables are available at the end of this book. This collection can be immensely useful for translators, librarians, researchers in science, students learning German, as well as foreign people conducting business and government affairs in Germany.